Briquette making machines supplied by AGICO GROUP are with high level of quality among the hundreds of briquetting equipment manufacturers. For AGICO GROUP, each and every customer’s satisfy is the final goal of our company. A good quality briquette making machine can bring you the benefit of good quality briquette product along with the low cost on maintaining of the machine. High quality biomass briquette contains about the same heat value as coal, and it is a more clean and green fuel. 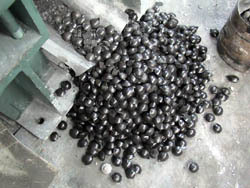 As the replacement of coal, it has the advantage of easier storage and transportation. No smoke and waste dust created in the burning, the discharge of SO2, NOX, CO is lower than the national standard. With the professional biomass fuel furnace and stove, the heat efficiency could reach the highest point; the pollution could be reduced to almost 0. The promotion of the biomass briquette needs 2 factors considered : the local air quality and the fuel sufficiency. When the fuel supply is insufficient, biomass briquette fuel shall be used and the pollution discharge standard of gas can be used in the application.